« Episode 28 of At-The-Helm is ripe for the picking…. … or the ” I’m not quite dead yet” memo for those of you regular readers and listeners. As usual the month of August was almost fatal but not, however it did cause a delay in the release schedule for the At-The-Helm podcast series. My apology for the delay. Show #28 is completed and ready to go as soon as I work out the details of needing more room to store these next 7 episodes . Having gone past my original anticipated 24 shows, keeping all 34 in the same easy toÂ use format will require doubling my expense for the chosen site, an unfortunate aspect for one as fiscally challenged as myself. At any rate I hope to make this adjustment in the next week or so and continue onwards to the end of the series. The upcoming episodes will be featuringÂ someÂ new instrumentation (piano, lap steel) and some different percussion and synthesizer stuff to boot so doÂ stay tuned I think you’ll enjoy the music. If you should find yourself motivated to contribute funds toward and/or comments about this series, please feel free to e-mail me at loopbozo@comcast.netÂ . 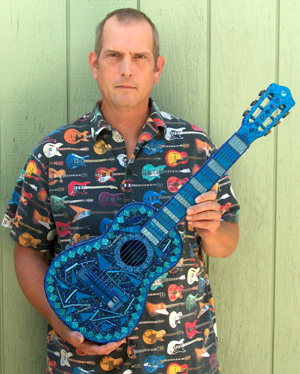 In the meantime here’s a photo of me holding my most recent musical mosaic sculptureÂ titled “The Little Blue Glass Guitar” which is now in the private collection of Mr. Jim Cunningham of Columbus Ohio. Again thanks for stopping by, andÂ have a good day.